Japonisme is a French term. It was first used by Jules Claretie (3 December 1840 – 23 December 1913) in L’Art français en 1872 (French Art in 1872). We have used to describe, in part, the Golden Age of illustration in Britain. The art work that was flooding Europe after Japan’s Sakoku (locked country) period were mere wood-block prints, or ukiyo-e, but no one could question their beauty. They were in fact not only genuine art, in many cases, masterpieces. In Britain, Japonisme ushered in the Golden Age of illustrations. Both word and art could be reproduced very quickly. An author retained the services of an artist who, for his part, retained the services of an engraver or engravers. The engravers of Alice’s Adventures in Wonderland (1865) and Through the Looking-Glass (1871) are the Brothers Daziel. Although some artists could illustrate their text, which was the case with Beatrix Potter (28 July 1866 – 22 December 1943), the author of The Tale of Peter Rabbit, in most cases, illustrating a book successfully required the collaboration and compatibility of a writer and an artist. The illustrations were then engraved, unless the illustrator happened to be an engraver. Therefore, when John Tenniel accepted to illustrate Lewis Carroll‘s Alice’s Adventures in Wonderland (1865) and its sequel, Through the Looking-Glass (1871), he and Lewis Carroll had long discussions. John Tenniel was accepting his first commission as the illustrator of children’s literature. Until he accepted to illustrate John Tenniel’s Alice, John Tenniel had been working as a political cartoonist for Punch magazine. He could draw, but the subject matter was brand new. 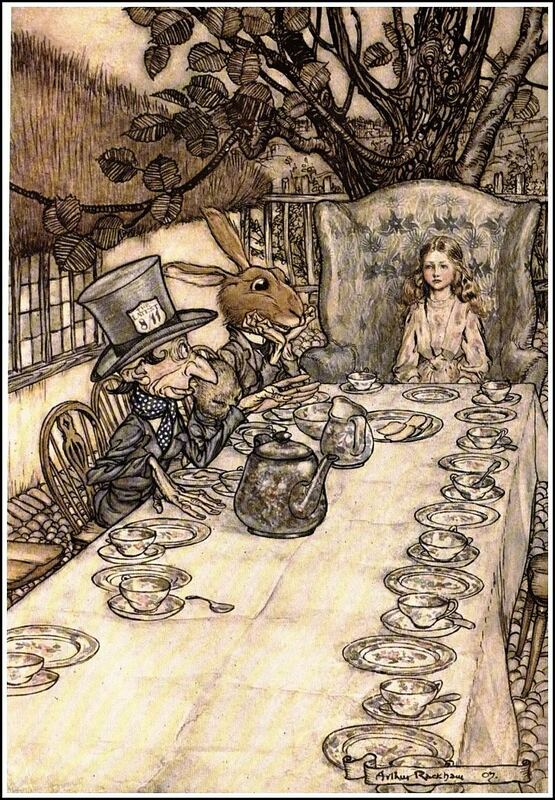 Consequently, if successful, illustrating Alice’s Adventures in Wonderland and Through the Looking-Glass would make history. Besides it was all the more challenging since Lewis Carroll was a pioneer in the area of literary nonsense. What was John Tenniel to do each time the text grew “curiouser and couriouser”? Edward Lear (12 or 13 May 1812 – 29 January 1888) had published his Book of Nonsense, in 1846, a few decades before the Golden Age of Illustration. In particular, he had popularized limericks, a literary genre, poetry to be precise. Witty literature was not new. It found a rich expression in the Salons of the first half of the 17th century in France and it was, to a certain extent related to the conceit (la pointe), the witty and ingenious metaphors of the metaphysical poets of 17th-century England. Alice’s Adventures in Wonderland and Through the Looking-Glass were very successful and all the more because children had gained importance. Although the mortality rate among children had not abated drastically, advances in medicine allowed parents to expect their children to survive childhood. Queen Victoria married her first cousin, Prince Albert of Saxe-Coburg and Gotha, a Prince consort, and gave birth to nine healthy children who married royals. Moreover the success of Lewis Carroll‘s and Tenniel’s Alice’s Adventures in Wonderland and Through the Looking-Glass, word and art, made history. Johannes Gutenberg‘s invention of the printing-press in the middle of the 15th century had been major revolution, one of the most significant in European history. Well, a book had been produced that included the reproduction of images. Printed books containing printed illustrations had been produced between 1500 and 1865 but Japonisme had eased the task. Compared to the labour of monks who copied books one at a time, Gutenberg’s invention made printing a text seem instantaneous, hence the revolutionary character of the invention of the printing-press. Let us also consider that the printing-press would lead to the growth of literacy which, in 19th-century Britain, was being extended to children as children’s literature was popular and, to be commercially successful, it demanded that word and art match in an almost inextricable manner. Printing illustrations, however, constituted a more challenging task than printing a text, a challenge that was eased by Japonisme. First, Japonisme allowed the rapid printing of illustrations. Second, it validated the work of illustrators. But third, it also eased the duplication of illustrations. Composition was did not ease a printer’s labour, but flat colours and the outline, the linearity of Japanese woodblock prints did and so did its flat colours. 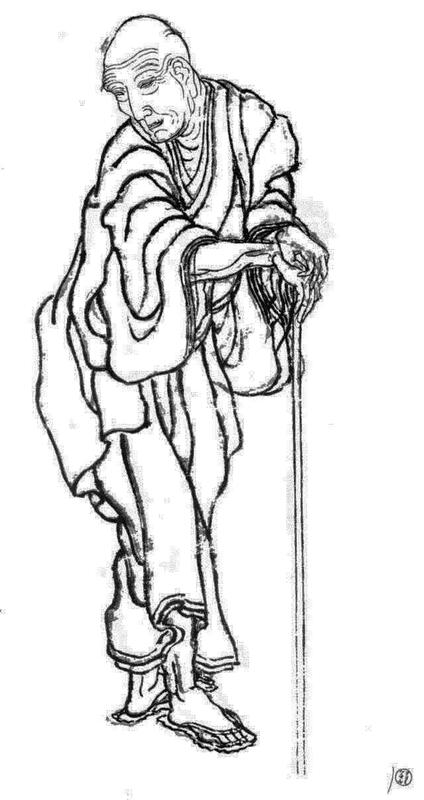 ., but, second, it also eased the work of illustrators as Japanese prints were mostly linear and flat. Painting the shadow of a cup was no longer necessary. Nor was it necessary to create dimensionality by using lighter or darker shades of a colour of combining colours. Rackham’s “Mad Tea-Party” exhibits a diagonal line and it is a linear work of art. The colours are poured inside lines, as in children’s colouring books. As for dimensionality it is expressed through the use of lines rather than a juxtaposition of shades of the same colour or different colours. Woodblock printing allowed for a measure of dimensionality through the use of lighter or darker tones of a colour or colours. However, there is very little shading in Janapese woodblock prints. However, British Japonisme of the Golden Age of illustration differs from Japonisme in other European countries in that certain British artists embraced socialism. The people or perhaps better said, le peuple, had gained status. In fact, Walter Crane (15 August 1845 – 14 March 1915) was both a member of the Arts and Crafts movement and the international Socialist movement. At its heart, socialism advocates greater equality in our society. 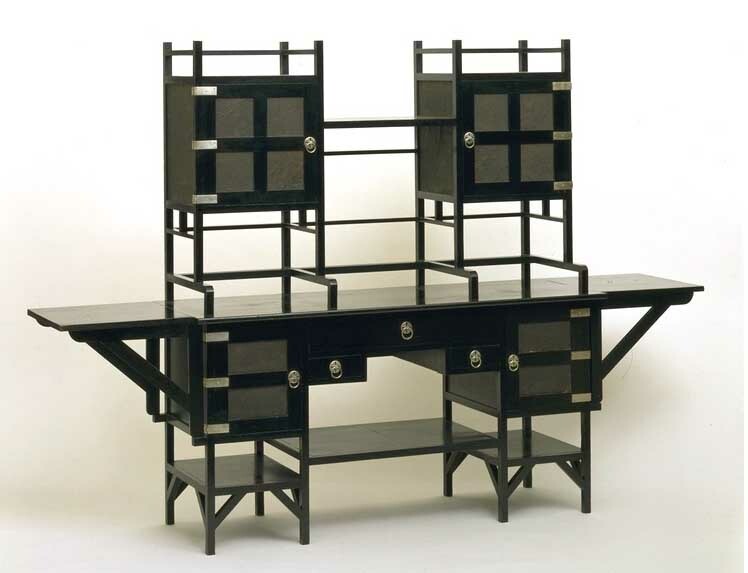 Moreover, the Anglo-Japanese style precedes Japonisme in France and it was first applied to furniture making by British furniture makers. The Anglo-Japanese style anticipated Carlo Bugatti (2 February 1856 – April 1940). In fact, the Arts and Crafts movement gave considerable importance to the decorative arts. 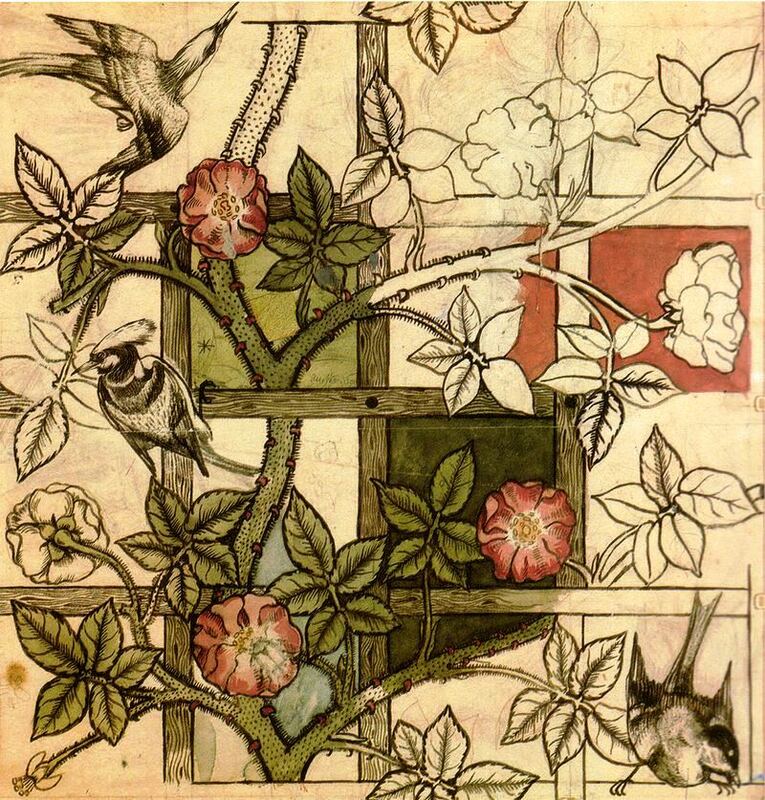 William Morris designed wallpaper and he also designed the Red House. As well, he decorated Kelmscott Manor, the Morris’ country residence. In the case of William Morris—not to be confused with William Morris-Hunt, one could perhaps speak of the domestication rather than the democratization of art. 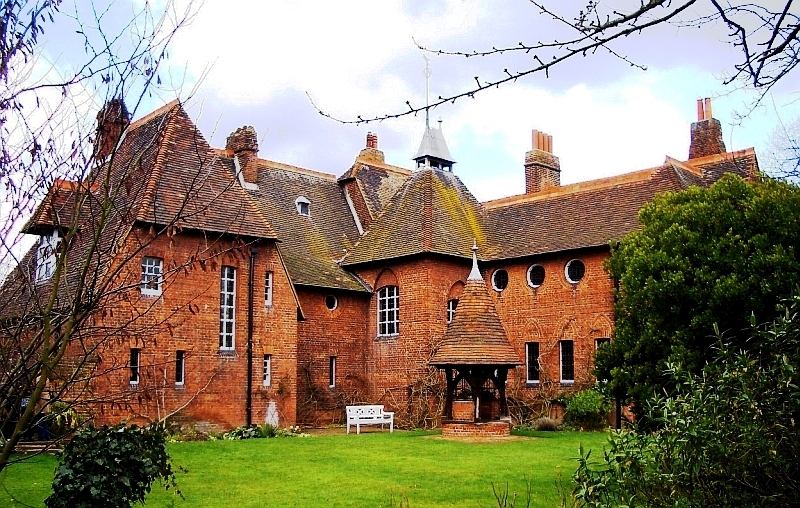 William Morris became very wealthy and the price of products sold by members of the Arts and Crafts movement could be compared to the price of today’s designer clothes, hand bags, watches, &c. Who can afford Louis Vuitton or a Rolex? However, democratization of the arts occurred mostly through its availability at a reasonable cost, which is associated Japanese prints, art that was affordable because it was reproduced. This is the main feature linking the Golden Age of illustration in Britain to Japonisme. 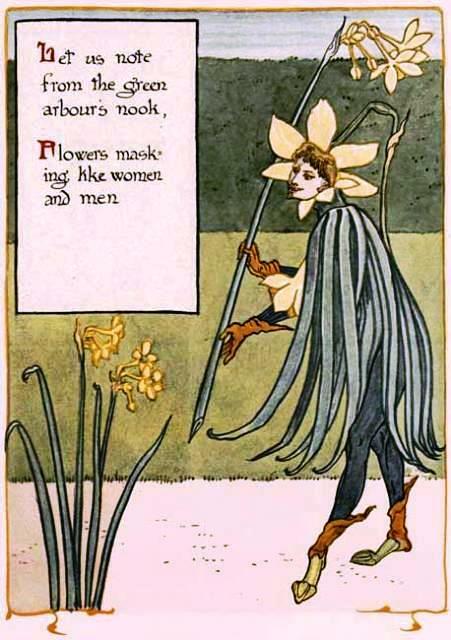 Practitioners were Arthur Rackham but to a far greater extent Walter Crane who illustrated Æsop’s Fables and countless other books. The Baby’s Own Æsop (Gutenberg [EBook #25433], The Baby’s Own Opera (Gutenberg [EBook #25418]). At this point, the democratization of the arts cannot mean affordability. It remains decorative and useful, but its usefulness is limited to art lovers. We’ve entered the Aesthetic Movement, art for art’s sake. We are looking at expensive furniture and objets d’art. The Pre-Raphaelite movement may be and is incorporated into the Aesthetic Movement. In other words, we’ve entered into the world of although design may reflect the orient, it isn’t quite as affordable as a copy of Alice’s Adventures in Wonderland. Less ethereal are the posters of Toulouse-Lautrec, Steinlen and Alphonse Mucha‘s Art Nouveau. But to conclude, we had best return to the art of the amazingly prolific Walter Crane. It is art we have experienced. Illustrators have had countless tales to illustrate: those produced by the Brothers Grimm, Hans Christian Andersen, Perrault, Madame d’Aulnoy. and anyone can rewrite the “Little Red Riding Hood and illustrate it. 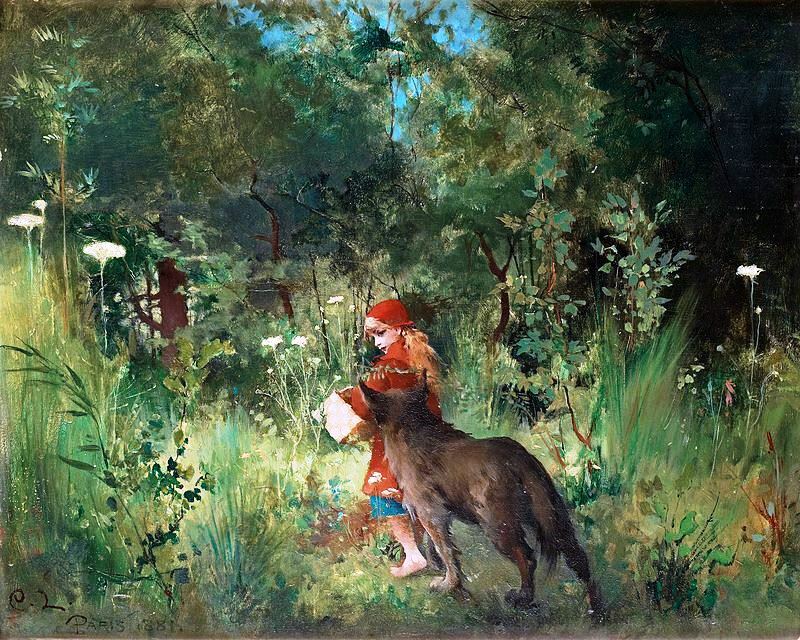 Carl Larsson illustrated the “Little Red Riding Hood,” in 1881. 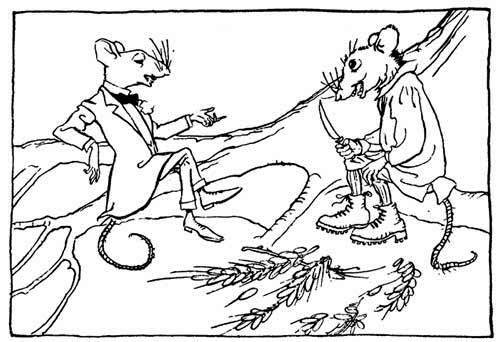 Moreover, there is still room for literary nonsense, Alice’s “curiouser and couriouser”. ← FEATURED: My lover, Lord Alfred Douglas.